The photo was taken by me and is a picture of an ornament that hung on my mother's tree for many years and now hangs on my tree. 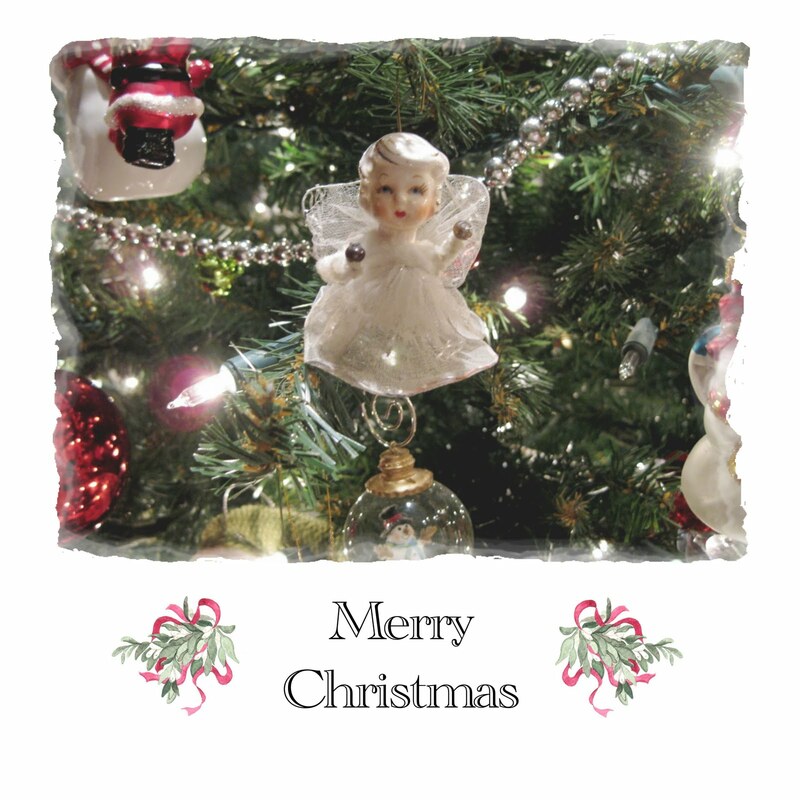 It's one of those cherished ornaments that reminds me of my mother and the many wonderful Christmas memories from my childhood. May you have peace and joy in the New Year! 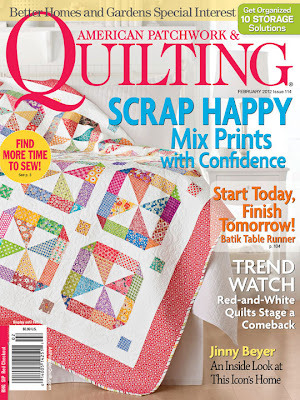 Many of my quilting and blogging friends have been receiving their February 2012 issue of American Patchwork & Quilting Magazine and noticed that my quilt is on the FRONT COVER. I was hoping to do this post before it hit the stands but heck, that's been my life of late. I seem to be several steps behind in a lot of things. Every time I look at the magazine I think. . . WOW!!! I really made that!! WOW!!! It's been a hard secret to keep and I'm super excited to finally be able to talk about it. It all started when I took a few quilts to Spring Market earlier this year and I had the opportunity to talk to a few Magazine Editors. I was really nervous but they were delightful and easy to talk to. It was fun sharing some of the things I'd been working on and they actually bought two of my quilts right then and there. Wow! Super exciting!! I could hardly believe it! I love making scrappy quilts so I decided to design a quilt that would use a lot of the fabric I have in my stash of 30's reproduction fabrics. It's borderline hoarding, probably, maybe. . . but, don't quote me on that. I also love all of the new fabrics that are always coming out so, I decided that I would mix the OLD with the NEW and make a very SCRAPPY quilt. 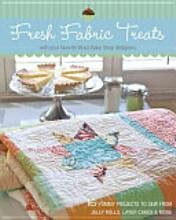 If you look closely at the quilt in the magazine and the pictures of the fabrics I used you will see some pretty old fabric. I've been collecting Aunt Gracie fabrics and other reproduction prints for many years. 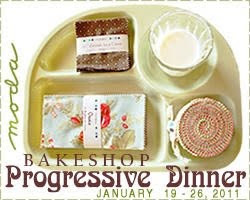 You will also see a lot of newer fabrics from some of my favorite designers like. . . Sandy Klop from American Jane, Lori Holt from Bee in My Bonnet, Monica from Happy Zombie, Flower Sugar Fabrics by Lecien, Amanda Herring from Quilted Fish, Denise Schmidt's recent collections, and lots of other designer's too. 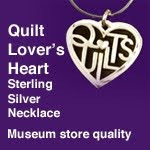 I really wanted to give the quilter the ability to use their stash but also allow them to go shopping. Who wouldn't want to have some of the newest cutest fabrics in their scrap quilt? 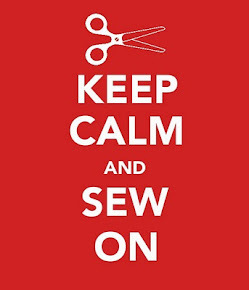 It was VERY HARD for me to STOP buying fabric. I kept telling myself, “Ooooh! Wouldnʼt this be cute? 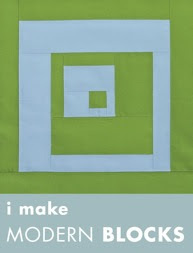 I have to have a bit of this!” I actually used over 150+ fabrics in this quilt. 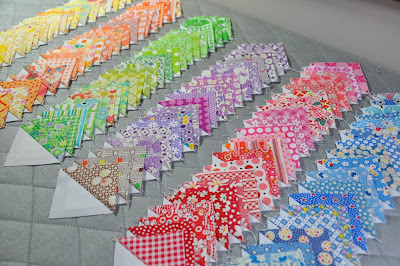 I hope you have fun playing with your stash and adding the newest cutest fabrics to your quilt. 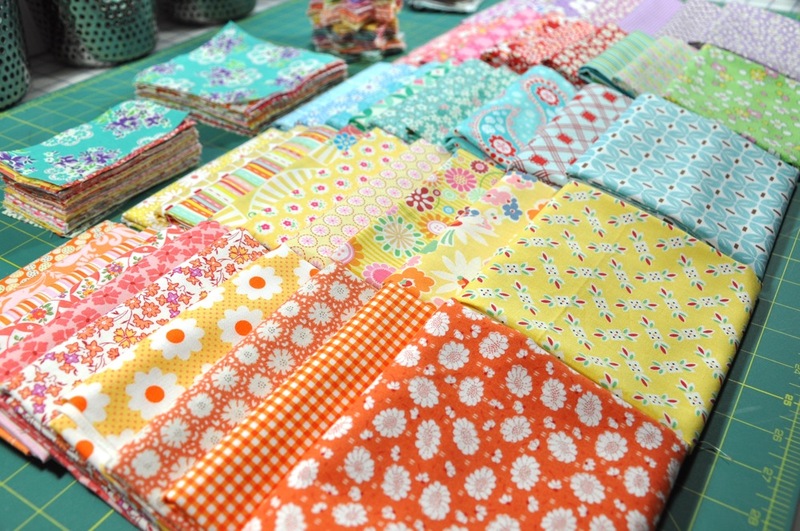 Here's a picture of some of the fabrics I used. 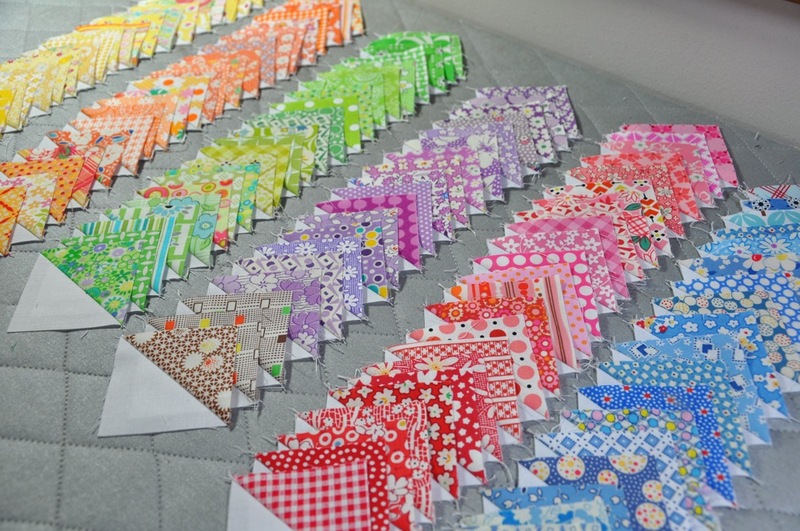 Here's a view of the multiple HST's I made for the quilt. Just so you know I did make about (8) 15" x 15" design boards to layout and plan each and every quilt block for this quilt. I like to call it "Organized Chaos" because I wanted the quilt to look esthetically pleasing yet have a totally random look I laid out 8 blocks at a time and would then sew them together. I also wanted all of the colors to be represented in each block. 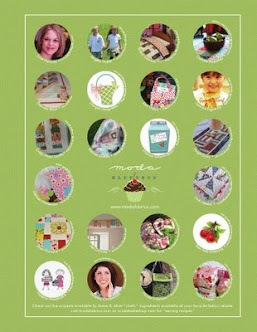 Go HERE for Lori Holt's tutorial on how to make your own Mini Design Boards. I do need to let you know that I changed a few things. . . First I made my boards bigger and instead of using hot glue to adhere the batting I used spray adhesive on the back of the batting to adhere it to the foam board and lastly, I didn't make any binding for the 15" x 15" boards since that would be 60" of binding for just one design board and at that point I really didn't want take the time to make that much binding. I loved using the smaller and portable design boards to construct these and other blocks that I've made and I know you'll love them too. We spent the weekend moving stuff out of one bedroom to the next so that we could paint. Now we have to move things out of the last bedroom so it can be painted before Thursday. That's when the last of the carpet is being put in. Yeah! Then the Christmas decorating and clean up can begin. 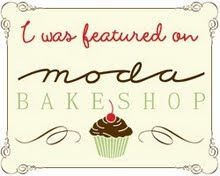 I'm hoping by the end of the week I can get the tree decorated, the bedrooms put back together, and the curtains hung. My daughter and her BF come on the 21st. We are excited for the festivities to begin.